Home// Social Media// What is Social Media Marketing? Social media marketing is exactly what it sounds like—using social media to promote your products and services. It sounds easy enough, but a successful social strategy actually requires careful planning and diligent monitoring. This is especially true considering that you aren’t the only one with the ability to talk about your brand on various platforms. Social media gives a voice to everyone ­– for better or for worse. All social media channels are driven by consumers, not businesses, and they decide what’s worth sharing or discussing. That’s why it’s important to not only stay active on social media, but to reach out in a way that resonates with your target market. This page explains what makes social media marketing unique from other marketing strategies, and highlights a few brands that got it right. If you'd like to speak with one of our social media marketing specialists, you can reach us at 855-601-5359. Reach more customers with social media marketing today! How is social media marketing different from regular marketing? Social media marketing requires the same basic element as any other channel: the right message sent to the right person at the right time. What differentiates it from other channels is the level of power consumers have over your message. In most marketing channels, you control the communication. You decide when and how to reach out, and consumers have the choice of responding or not. Those parameters don’t exist on social media. Consumers are going to talk about your business (and your competitors) whether you want them to or not. In other marketing scenarios, this would likely motivate you to ramp up your campaigns and send out even more promotions. However, social media audiences aren’t sharing ads—they’re sharing content that interests them, regardless of where it comes from. The way to get into their conversations isn’t to talk more loudly about your products and services, but rather to talk about the things that interest them. That doesn’t mean you have to abandon your goals of spreading the word about your business and increasing revenue. It just means you have to take a different approach towards meeting those goals. What are some examples of social media marketing? Many businesses use social media marketing in conjunction with other marketing channels to develop an interactive, multichannel plan. Some campaigns, however, stand out in their own right, accomplishing the company’s goals without the assistance of traditional marketing. Here are a few examples of successful social media marketing campaigns. One of the reasons social media is so popular is because it gives users a chance to join in the conversation. A good social marketing campaign should let them be active participants. 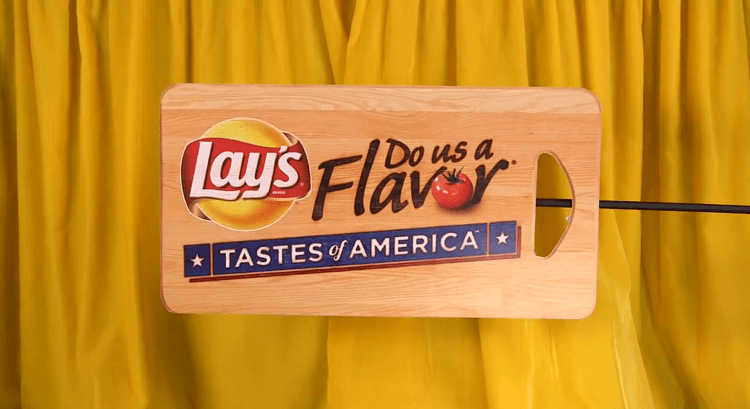 That’s exactly what Lay’s did with its Do Us a Flavor campaign in which loyal customers submitted their ideas for a new potato chip flavor for a chance to win $1 million from Frito-Lay. The company set up a dedicated website and then asked people to submit their ideas on Facebook and Twitter. Nearly 4 million people responded, and Lay’s tested the most promising choices. After narrowing the field to three options, the company produced the finalists, sold them in retail outlets, and asked consumers to go back to social media to choose their favorites. Sales of Lay’s Potato Chips increased by 12 percent the first time the contest ran, but it generated so many mentions that Frito-Lay ran the contest again in 2014. That year, 14 million people submitted ideas and the Lays Facebook page generated 6 million likes. For-profit companies aren’t the only ones that can generate money from a great social media campaign. Make-a-Wish Foundation proved the power of social media in nonprofit marketing with one of its biggest gifts ever. 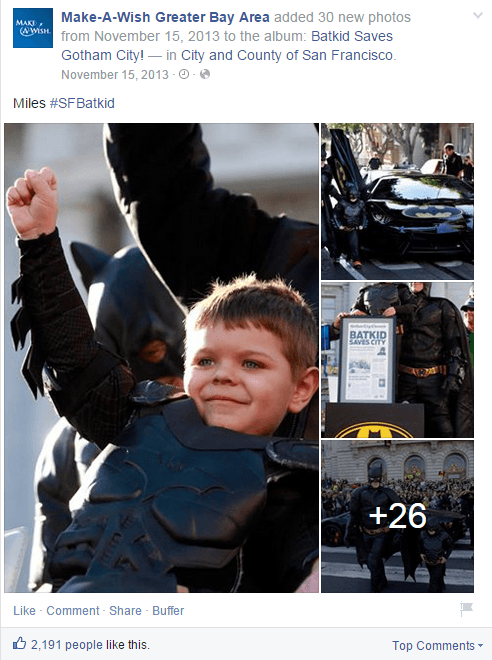 In 2013, Miles Scott, a 5-year-old who had been battling cancer most of his life, wanted to be Batkid for a day. The foundation put together an event and sent an email a month beforehand to enlist a few volunteers to help out. The story went viral thanks to supporters on Twitter and Instagram, and 12,000 people ended up contributing their time and talents. In fact, the story generated so much publicity that the entire city of San Francisco turned into Gotham City for a day. Although the campaign was meant to make one kid’s dream come true, national interest in the story helped the Make-a-Wish Foundation increase donations by 26 percent. Some social media marketing plans succeed because of buy-in from other businesses. Such was the case with Purple Your Profile, a joint project by Chevy and the American Cancer Society that was created to raise more money for cancer research. The campaign actually began on TV with a Super Bowl ad, but it quickly migrated to social media. Viewers of the ad were asked to color their profile pictures purple to show they supported the fight against cancer. 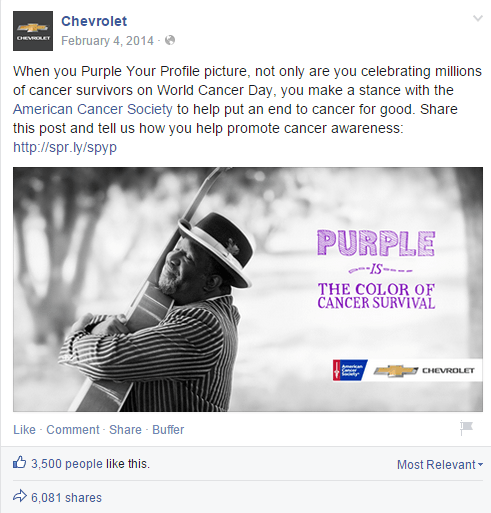 For every purple profile picture, General Motors donated $1 to cancer research. By the end of the campaign, 1.3 million Facebook users and 700,000 Twitter users responded, helping to generate more than $2 million in donations to the American Cancer Society. Meanwhile, Chevy got 5x the number of likes on Facebook, and the story appeared 45 million times in news feeds. Social media is just one element of an overall Internet marketing strategy, but it can be one of the most effective if you use it well. If you want to start using social media to grow your business, or improve upon your current profiles and strategy, feel free to contact us! Our dedicated team of social media experts is more than happy to help you reach and engage with potential customers.